Meeting in the shadow of the Brussels terrorist attacks, EU Justice and Interior ministers vowed to deepen joint intelligence gathering and swiftly push through measures to share airline passenger information and step up the fight against terrorism. "We don't need new plans, we need to fully implement the plans and measures that have been taken," said Interior Minister Ronald Plasterk of the Netherlands, which currently holds the European Union's rotating presidency. Coming two days after the Brussels bombings that killed more than 30 people and injured more than 260 others, the emergency meeting offered a stark counterpart to the EU's usually staid gatherings — especially since it took place near the Maalbeek metro station, one of the targets of the attacks. "Everybody feels the attack on Belgium was an attack on Europe and the values we stand for together," Plasterk said. "Europe has been under attack before. But we've always defended liberty and democracy and we will do that together." The meeting comes as Belgian authorities face growing criticism over security lapses, with more evidence of significant links between the Paris attacks in November and Tuesday's strikes in Brussels. WATCH: "EU Emergency Meeting Focuses on Security"
But Belgium is not the only country to face criticism. "There is a lack of trust, otherwise things might have been predicted and then prevented," said European Home Affairs Commissioner Dimitris Avramopoulos. Of the Brussels attackers, he added: "they were homegrown, but they were also quite well known to intelligence services. If we were sharing information, we might dissuade their actions. The same for the perpetrators of the attacks in Paris." The Islamic State (IS) group, which has claimed responsibility for both attacks, released a video Thursday describing the Brussels strikes as a victory and urging its followers to wage jihad. Critics are particularly questioning how the Brussels suicide bombers could have planned and carried out the attacks under the nose of Belgian authorities, since many had dubious backgrounds and links to the Paris attacks. Brothers Khalid and Ibrahim El Bakraoui, two of the three suicide bombers Tuesday, had criminal records but no known jihadist ties. People observe a minute of silence at a street memorial to victims of Tuesday's bombings in Brussels, Belgium, March 24, 2016. Turkish authorities say Ibrahim El Bakraoui was caught near the Syrian border in 2013 and extradited. Belgian's federal prosecutor's office has since said European and international arrest warrants were issued for Khaled El Bakraoui, in connection with the Paris attacks probe. Najim Laachraoui, named by local media as the third suicide bomber, was stopped by Hungarian authorities last year driving in a rented car with Paris attacks suspect Salah Abdeslam. Abdeslam is now in a maximum security prison in the Belgian town of Bruges and is expected to be extradited to France. After initially resisting the move, his lawyer says he wants a speedy extradition to "explain himself." Earlier in the day, Belgian justice and interior ministers tendered their resignations, which were rejected by Prime Minister Charles Michel. Speaking to local broadcaster RTBF, Justice Minister Koen Geens acknowledged Belgian authorities could have been faster in following up on information passed on by Turkey about Ibrahim El Bakraoui. "The information was passed on, but we have not been diligent, or probably not diligent enough," Geens said. But following the EU meeting, he said things were changing swiftly in terms of sharing information and joint investigations among European countries. A case in point took place last week, when both French and Belgian police carried out raids of residences linked to where assailants of both the Paris and Brussels attacks are believed to have stayed. Michael Hayden, former director of the U.S. National Security Agency, told VOA the Brussels attack was "almost inevitable." "I realize that's a pretty dramatic word," Hayden said. "But if you look at what has happened ... the soft targets, the transportation targets, the maximum civilian casualties, [it's] something we could see." 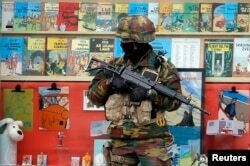 A Belgian soldier stands guard in front of a shop selling Tintin comic books in central Brussels, Belgium, March 24, 2016. Hayden also said it is "certainly not the last" attack IS will carry out, adding that the group has a "network that seems to be active and thriving in the heart of Europe." The retired four-star general, who also headed up the CIA, said European intelligence and security agencies could do a better job at sharing information. Counter-terrorism expert Thomas Reynard of the Brussels-based Egmont Institute, believes cooperation between French and Belgian police is often underestimated. "It's not like we just started cooperation," he said. "Obviously cooperation between police, between intelligence services anywhere in the world — including often within one single country — is also difficult." "So is this a case of perfect cooperation — definitely not," he added. "But what's important is these remain hiccups, rather than a major lack of cooperation." In Brussels, there was little sign that the public is eager to place blame for the attacks. Belgians observed another minute of silence earlier Thursday for the victims of the Brussels attacks. Many also placed wreaths and candles in front of makeshift shrines at the Maalbeek metro station. Asked whether Belgian authorities could have done more to prevent the attacks, state worker Griet Smaers said she didn't know. "That's a question that will be answered in the next weeks and months," she added. "Right now, I just want to be here — this place where very weird and tough things happened." VOA’s Jeff Seldin contributed to this report.